Michael: Recently I watched the entirety of HBO’s “The Leftovers,” which I enjoyed immensely. One of the show’s theme songs is Iris DeMent’s “Let the Mystery Be,” which means exactly what it sounds like: don’t try to find the explanation in everything, just enjoy the ride that the unknown provides. Mainstream comic book readers don’t subscribe to this philosophy when it comes to the capes and tights crowd, myself included. Dark Days: The Casting is a dense issue that will likely have our kind baffled as to what we just read. Am I the only one who hasn’t been clear on what Metal is going to be about? In the age of solicits, leaks, and previews that’s a rare feat for a major comic book event to accomplish. Sure, we have gotten the sense that Nth metal and a “Dark Universe” are going to be involved but that’s about it. 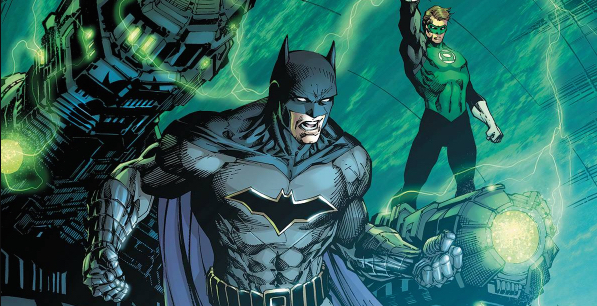 Dark Days: The Casting further emphasizes that Nth metal is the inexplicable missing link in the DCU that connects the Hawks, Batman, The Green Lantern Corps, and Duke Thomas, among others. Scott Snyder and James Tynion IV write a story that contextualizes Snyder’s Batman run in addition to brushing up against a few mysteries of DC Rebirth. The Court of Owl’s electrum, what happened to The Joker at the end of “Death of the Family,” and dionesium are all connected to Nth metal. The Joker often steals the focus in a given Batman story and my write-up will be no exception. While Snyder has stated that Metal will in no way answer the Rebirth question of “The Three Jokers,” it’s hard not to have that in mind with the recent revelation that Batman has had Joker — drawn in his Endgame look — trapped in the Batcave for some time. Continuity mysteries aside, the main question we all have is “why is he down there?” Joker claims to Hal Jordan and Duke Thomas that he’s trying to prevent a “dark crisis” that has to do with unearthing the Nth metal. I was never a fan of the New 52 pairing of Batman and Green Lantern in Justice League but here Snyder and Tynion make it work. Whereas New 52 Hal would be the dumb jock and Batman would be the voice of reason, Snyder and Tynion make the two equals. 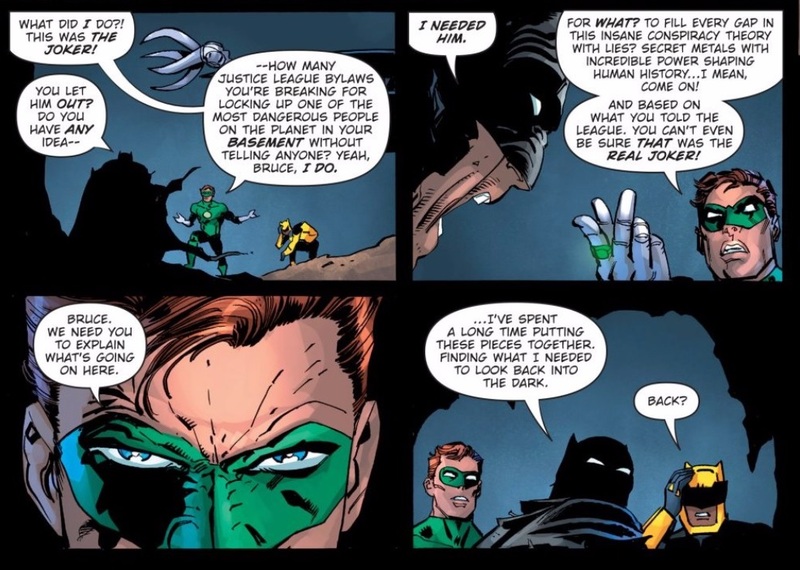 Hal is appalled at the fact that Batman would hold Joker prisoner, citing Justice League bylaws and Guardian edicts. This is Hal Jordan as a cop, dealing with the extreme vigilantism of Batman. Another reason I love Hal in this issue? He lays it all out for us. Sometimes a little bit of accusatory exposition is just what the doctor ordered. Hal is serviced very well in this issue as a hero, colleague, and mentor. The only part I was kind of disappointed with was an excellent story moment that lost its kick on the continuing page. Hal brags to Joker that he’s in trouble because Hal is a “decorated member of The United States Air Force” and he just landed in the Batwing. When the scene picks up a few pages later John Romita Jr. draws Hal with Joker in the Batwing’s claw grip. Is oversized claw technique in Air Force basic training? Besides the Nth metal itself, a lot of the direct correlation between Hawkman’s journal and the present day DCU is still uncertain. However, Snyder and Tynion make a clear thematic connection among Hawkman, Duke, and the forming of the Nth metal itself. As the issue comes to a close Hawkman writes how we are not masters of our destiny but the exact opposite. From what The Joker told Duke and what we eventually see, it’s apparent that Duke might not be in control of his own destiny. Snyder and other Bat writers have had Duke kick around the Batcave rather aimlessly with no purpose or nickname for a couple of years now. Dark Days: The Casting would have us believe that it’s all due to a greater purpose. It seems that, like Hawkman, Duke is finding himself in a preordained adventure and all he can do is play his part. The first time “sigil” is brought up is in reference to “the demon who took the sigil of the great and terrible bat.” Later on Joker refers to Duke as “the signal” of something that he can’t allow to pass. If Joker’s to be believed — and I think he is — both Duke and the bat demon are to be seen as harbingers of the end times. And I know it’s probably the Grant Morrison Batman fan in me, but I can’t help but notice the design that Andy Kubert gives this bat demon is similar to Barbatos — the god that Dr. Hurt worshipped. It’s a stretch, but I had to mention it. Oh man Mark, what did you think of this very very thick issue? Do you think that this might’ve been better served if it was split up into two issues? Were there any DCU Easter eggs that you really dug? The opening Hawkman pages had quite a few by my count. Also, I think I would read an entire series of DC’s immortals like Ra’s al Ghul and the Wizard Shazam just hanging out. Mark: I kind of hate this issue. The previous Dark Days entry was not a perfect comic, but it was at the very least approachable in a big, dumb blockbuster movie kind of way. Yes, the plot was murky, but it was easy to chalk that up to the issue being the first entry in a multi-part story. Now after reading The Casting, whatever greater story Snyder and Tynion are trying to tell is more than murky, it’s impenetrable. And I don’t know that splitting this story up over two (or even more) issues would help resolve the main problem: I just don’t understand enough about what Hawkman is up to to care about it. Snyder and Tynion need to choose between Hawkman’s monologues taking up half the issue, or Hawkman speaking in nothing but vague platitudes, because their current approach of doing both is not working. And while Snyder has earned enough goodwill to trust that it’s all leading somewhere eventually, it’s exasperating right now for Hawkman to recount a story involving Ra’s al Ghul, only for Talia to show up a few pages later and explain the whole thing again for the cheap seats. If you strip out the Hawkman panels, you’d at least be left with a serviceable Batman tale, but even here the usually reliable Snyder and Tynion fumble in unexpected ways. 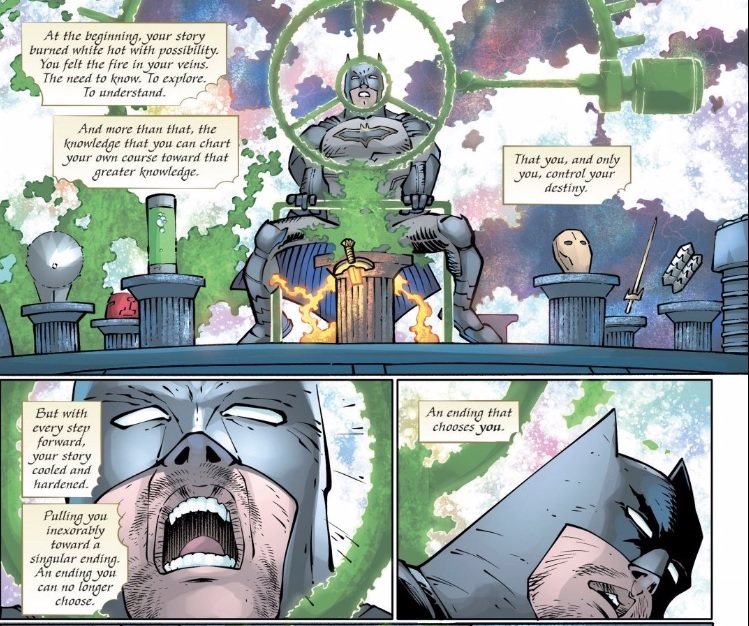 With the reveal that Duke is biologically connected to the Nth metal, we’re perhaps beginning to see the first notes of Snyder’s long term plan for his previously aimless creation, but Duke is also saddled with some deeply bad dialogue throughout the issue. Michael, neither of us even mentioned Wonder Woman showing up for a few seconds to gift Batman with Chekhov’s Sunblade. It’s barely worth mentioning since Batman passes it on to Talia mere moments later, but it goes to show how many incidents that fail to register this issue has. This is a seriously chatty issue, with page after page given over to characters doing little but looking at each other so as to not get in the way of the enormous dialogue boxes crowding the panels. Between the overly expository writing and the art duties being divided among three pencilers, three inkers, and two colorists, the seams are really beginning to reveal Dark Days as a hastily cobbled together event series. I’m sad to say that I have to side with Mark on this one — after liking the first part a lot, this issue fell flat for me. There’s not enough character work, just muddled and practically impenetrable lore. Rather than split this into two issues, I’d combine this with The Forge somehow — not only would this work better, as a whole, as a more streamlined and singular experience, but it would help with the marketing. Two differently titled books especially leading directly into each other, as if they’re issues 1 and 2 of a series, are just strange. Good catch. I think you’re right that Nth Metal is being set up as the source of all superpowers (even Green Lantern’s power ring seems to be affected by it). I’m not yet sure how I feel about that. Want to know one thign I really like about the Doctor Strange movie? SInce the MCU is roughly in real time, TOny Stark became the first public superhero in 2008. 4 years later, the Avengers were formed. 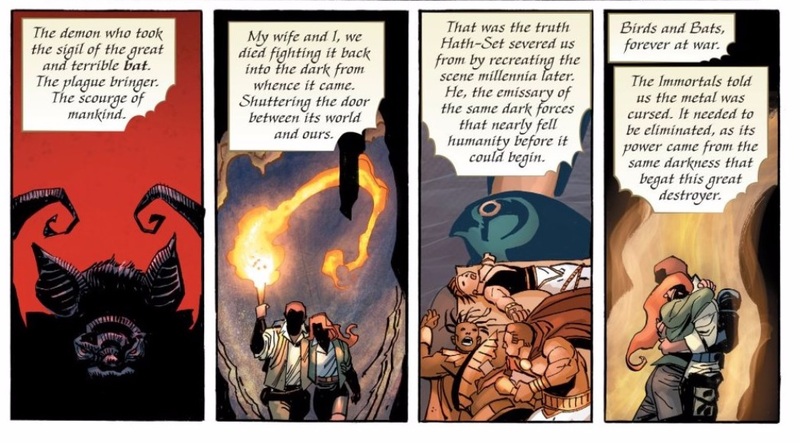 And another 4 years after that, the Ancient One, who defended the world as Sorcerer Supreme for milennia, died, without ever connecting to the Avengers. She’s been a superhero longer than any except maybe Thor have been alive, and not only are they ignorant of her, they are ignorant of the very powers she uses. THe world is so big, a character as important as the Ancient One can exist and die without the main characters having any form of connection. And that is the power of a universe. Just like the real world, you have a universe so big and so complex that no single thing defines everything (it is theorised that despite Trump’s efforts, America will fulfill its Paris Accords agreements simply by the sheer power of economics). If Marvel did a movie where Kang goes back in time and kills Doctor Erkskine in the crib, stopping the experiments that created Captain America, only half the Avengers would actually disappear. If art is about truth, there are few single, more imporant truths than the idea that at every moment, things happen that are completely disconnected to you. That the universe is so big that there is no single narrative, just a million smaller ones, beginning and ending at different places. I had originally hoped that Metal, that had been rumoured for ages, was going to be the thing that would start to fix DC and make it readable again. Until the announcement came and I got the sudden sense it was going to be a disaster. And it was for, as Michael described, the fact that it is unclear what Metal is going to be about. While I understand the need to hide spoilery info, especially of key events in the set up that haven’t happened yet, the fact that Metal was annoucned with no information, and nothing has ever happened is worrying. When Secret Empire was first announced, we knew what it would be about. When Forever Evil was announced, the first poster made clear what we would be reading. Both had secrets they couldn’t reveal just yet, due to major events that would happen immediately before the books begun. But they were advertising a story to us. Not spoiling anything, but giving us an idea. And that’s why the announcement of Metal worried me so much. Because I’m familiar with stuff being advertised and tip toeing around the story. And the sad reality is, those stories are defined by having massive, gaping story problems. So when DC announce their next event, written by the writer known for saying a bit more than he should in interviews, and no one has any idea what the book is about, even at the most basic level (I mean, come on. Marvel v Evil Fascist Steve Rogers or Injustice League v Crime Syndicate is hardly a spoiler). And as Metal came closer and closer, including releasing two issues, still there is no idea.